You can import contacts from your Evite account by exporting them to a spreadsheet and then uploading the spreadsheet to Punchbowl. To do this, go to the Events page and click on the Past Events tab. This will show you a list of all your old invitations. 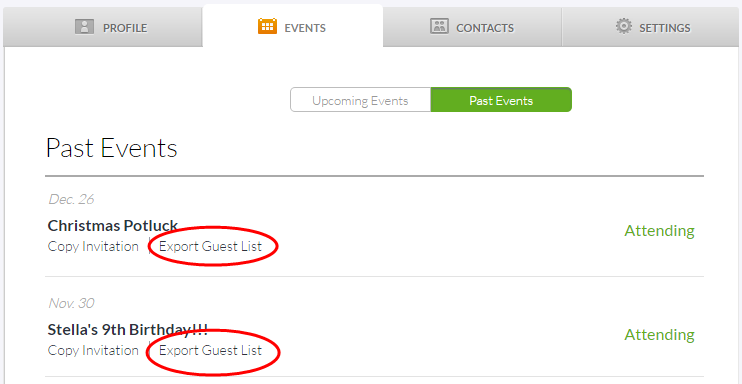 Click the Export Guest List option to download a spreadsheet of the contacts from that event. You can then upload this spreadsheet file to Punchbowl using the Import Contacts option on the Add Guests page. To import all of your Evite contacts, email us at help@punchbowl.com and we'll provide easy instructions. We typically respond within 30 minutes during normal business hours.